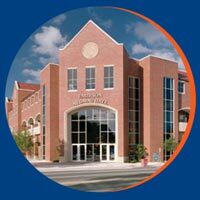 Located across the street from Ben Hill Griffin Stadium, Emerson Alumni Hall is home to the UF Alumni Association. UF alumni, students, parents and friends are always welcome through our doors. Built in 2002, Emerson Alumni Hall was made possible thanks to a donation from Bill and Jane Emerson.